Brian Johnson is from Mobile, Alabama. He was born there on August 21st, 1979. After high school, Brian sought out a career in the Fire Department. He graduated from the Alabama Fire College in Tuscaloosa, Alabama. Brian was assigned to several different engine companies in Tuscaloosa after graduating but eventually transferred to the Fire Department in his hometown of Mobile, Alabama. He was assigned to Engine Company 8 and transferred later to Truck 17. He was also a member of the Urban Search And Rescue FEMA team in Mobile. 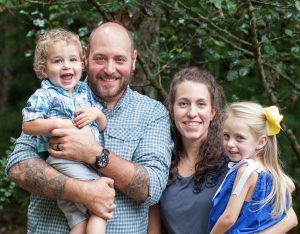 Brian and his wife Christy made the decision to leave the department and go to work for a youth organization that does outreach for teenagers called Young Life. They now live in upstate MI where Brian is the camp manager at a Young Life owned outdoor adventure camp. Brian and Christy have two kids, Eby and Hutch. Brian works for Doulos remotely handling IT needs.